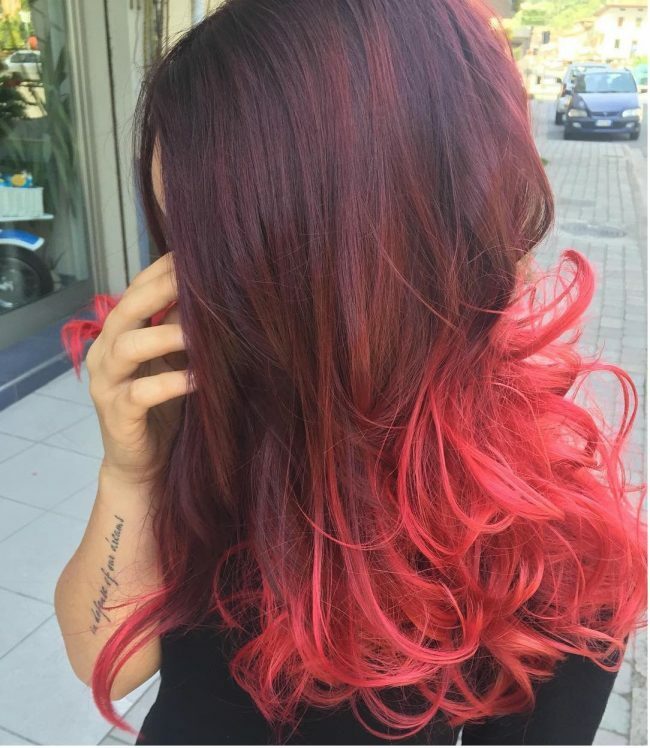 Red ombre hair is an ombre style that features at least two color combination with red being one of the main colors. This style looks great on women who desire to add a vibrant touch to their hair. There are many different variations in this style and it would be really great if you familiarize with them prior to experimenting them out. 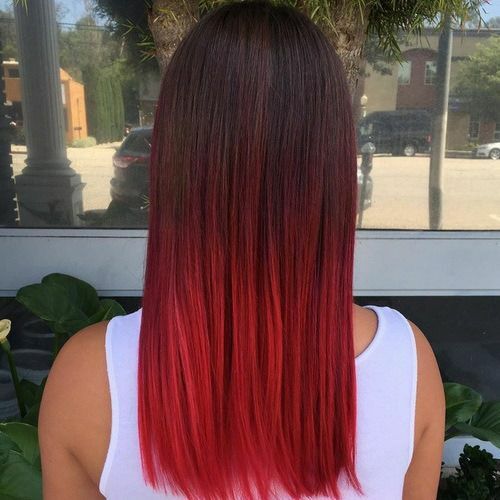 Below are 30 cool examples of red ombre hair that you might want to incorporate in your hairstyle. 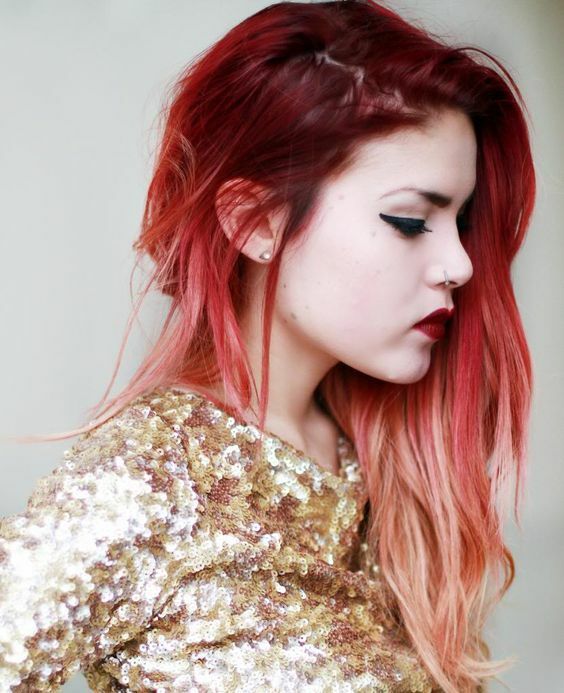 Here is a viable ombre solution that looks great even on women with black hair. 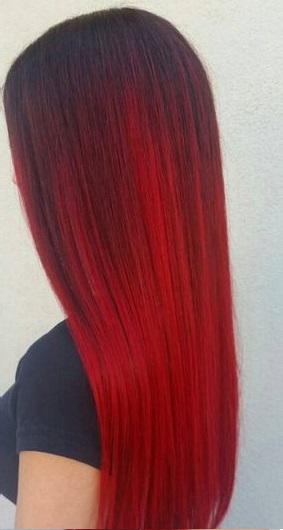 It transitions from a black top to a bright red bottom creating a perfect half-up, half-down ombre. The locks are layered and styled into wonderful waves that spice up the whole look. 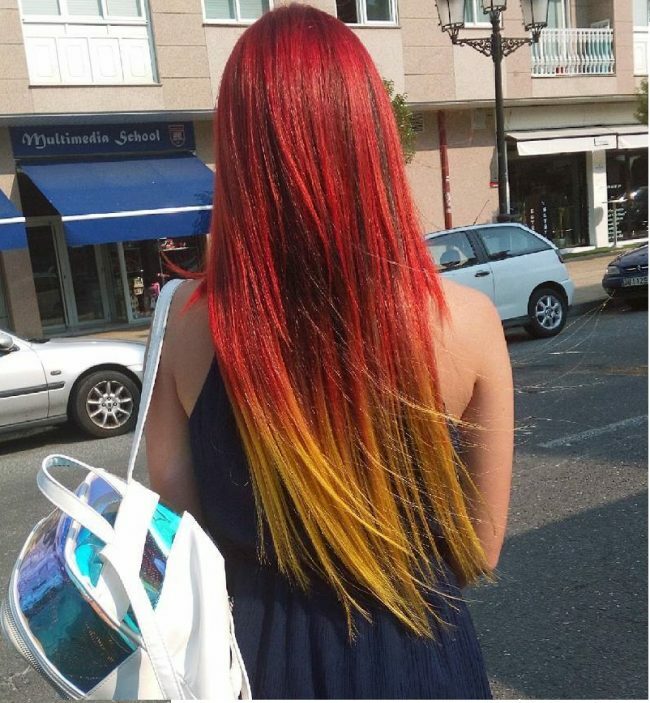 It is definitely a unique step to ombre hair and a perfect match for dark hair girls. If you are not into bright hair, then this color combo might just work fine for you. It sports the elegance of dark brown locks that have balayage highlights of red. The color combination creates that sweet chocolate look that is quite hard to resist. The locks feature plenty of length and are given a slight side sweep to keep them clear off the face. Lots of curls come in handy to add some volume to your locks. Dip dyeing technique is one of the coolest ways of achieving a perfect ombre. 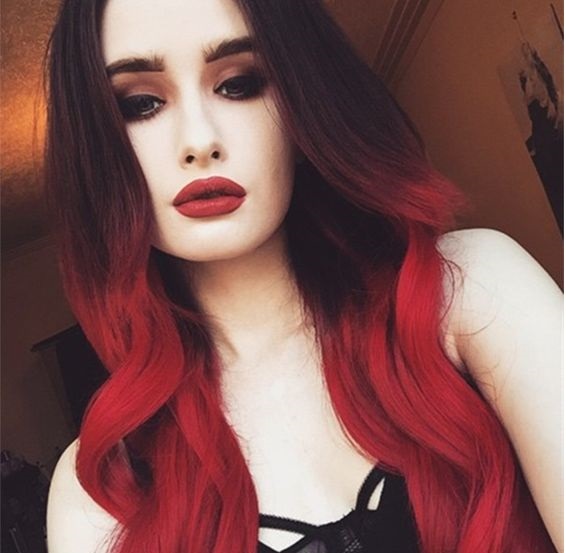 The bottom of these sleek white locks are dipped into red dye to create a wonderful white to red ombre. The locks sport plenty of length that hangs just below the waist. This is a brilliant color solution for light skinned women with long locks. A dark brown hue can be quite boring at times. But there is a way of adding some life to it - coloring the bottom with bright red tone. This forms a perfect transition from dark roots to really bright ends. This color idea works well on medium to long locks. It is an excellent choice for women who desire something to show off. 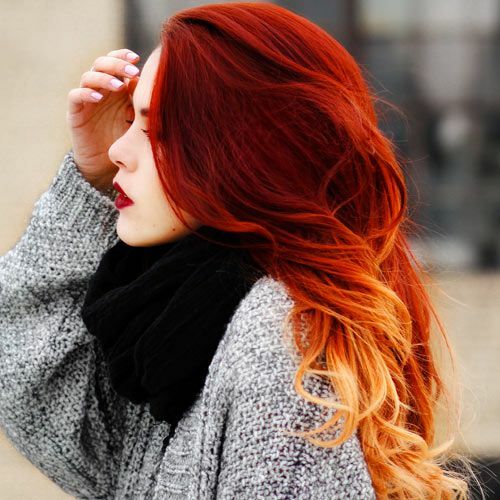 The gorgeous and fiery look of this ombre is simply amazing. It transitions from red at the top to blonde at the bottom. 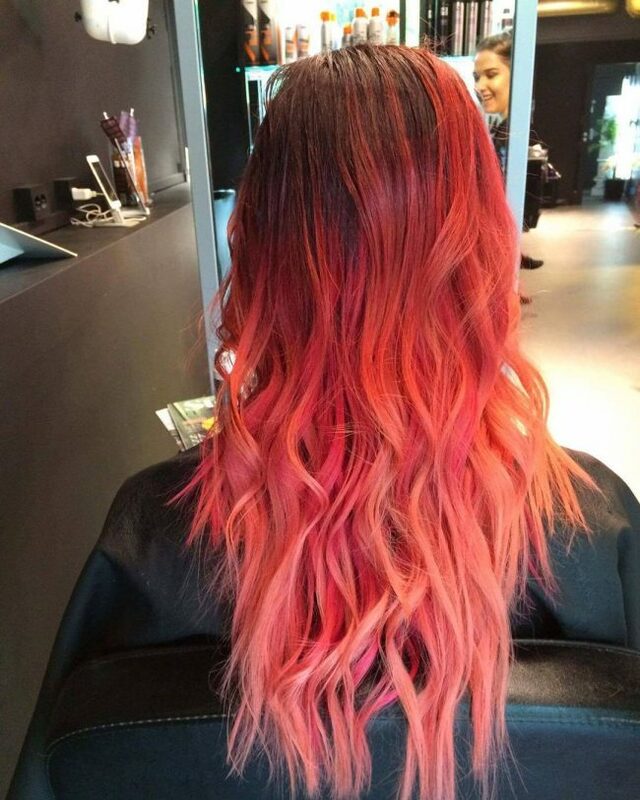 The colors blend well to create the illusion of a luminous flame, hence the name fiery locks. Curls and waves are added to give the locks more dimension and add a sweet touch to them. The style is a nice choice for summer season. 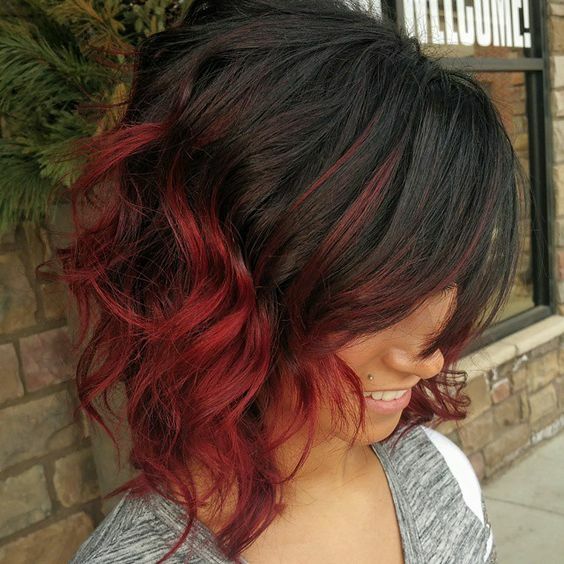 Black to red ombre is one of the easiest to experiment with. It looks simply amazing even on short locks. You can style it into a balayage ombre since the two colors blend harmoniously to take your gorgeous looks to a whole new level. The locks are textured and curled to shed off some weight and add tons of volume to them. It is one of the greatest hair inspirations for light and chocolate skin women. Don’t want to go blonde? Well, this color solution might be worth a try. Give your blonde locks a red tone at the top leaving a blonde bottom. Go further to incorporate a flower crown that creates a wonderful look for those bridal parties. Beachy waves are added to make this style a real attention grabber wherever you go. Love the colors? Well. Why not give your blonde hair a twist of color? 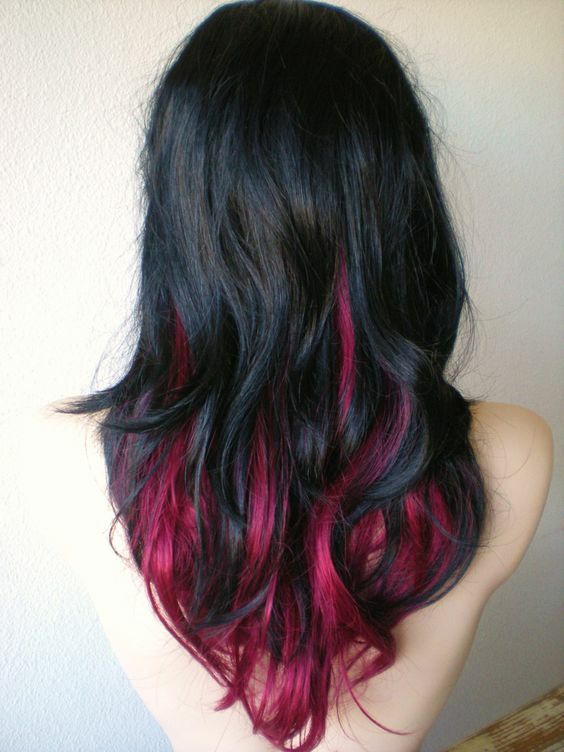 Use chalk to color the top red and leave blonde at the bottom. Give your locks some added beauty by styling them into wonderful beachy waves. The result is a pretty cool look that looks amazing when paired with dark sunglasses. This style is a perfect match for women with medium or long hair. Here is a cool way to driving your admirers crazy. It involves giving your dark brown locks some more life. The top is left dark brown to give the locks that dramatic appeal of shadowy roots. 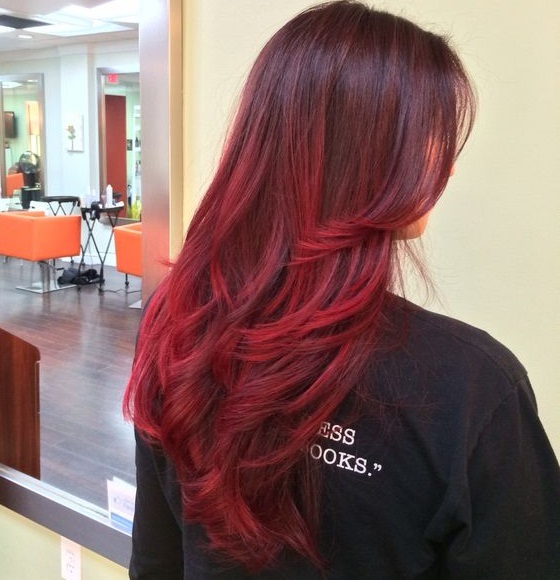 The rest of the locks sport the elegance of a vibrant red tone that adds some flair to your looks. Redken Gel is used to give the hair a silky smooth finish. 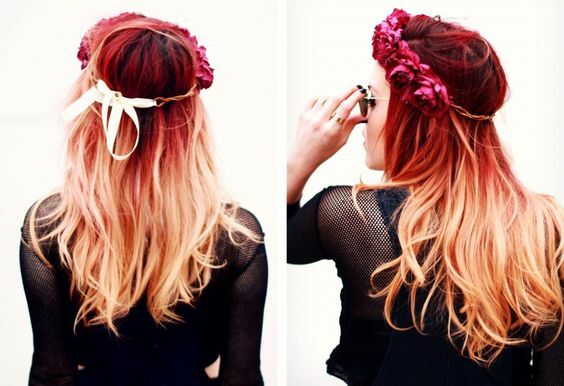 Here is a way of adding some delicate touch to your red ombre hair. The bottom is given the soft and feminine appeal of a pink tone. 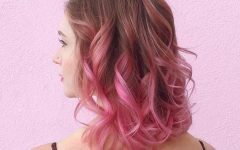 The color transition from red to pink creates the illusion of faded hair. A side part and lots of waves come in handy to take your gorgeous look to new heights. 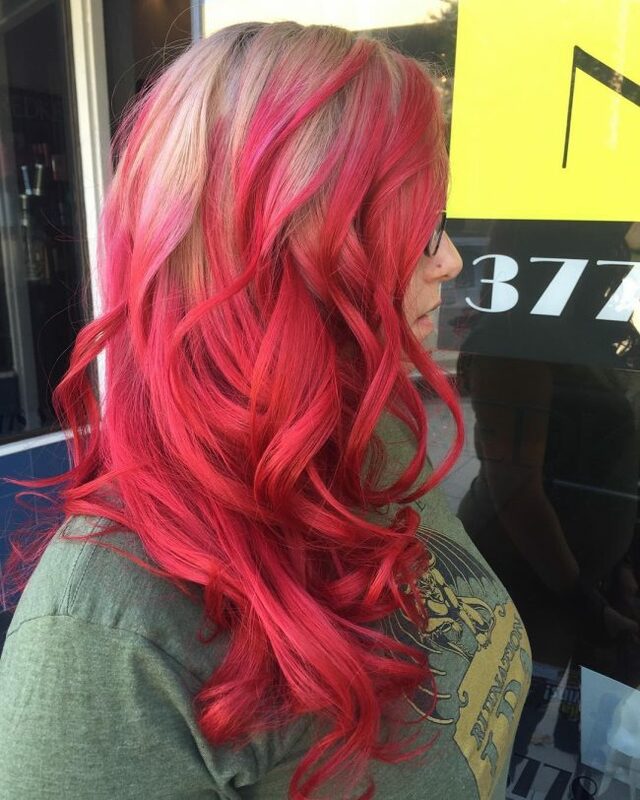 This is a wonderful color transformation that melts red hair locks into a soft pink at the bottom. The locks are styled into waves that make the color combo really stand out. A pair of glasses can be added to give you some bold look. This style looks great, especially when paired with a funky outfit. This color idea looks really amazing. It provides the elegance of multiple colors that blend harmoniously to add more swag to your looks. It sports dark brown locks at the top. 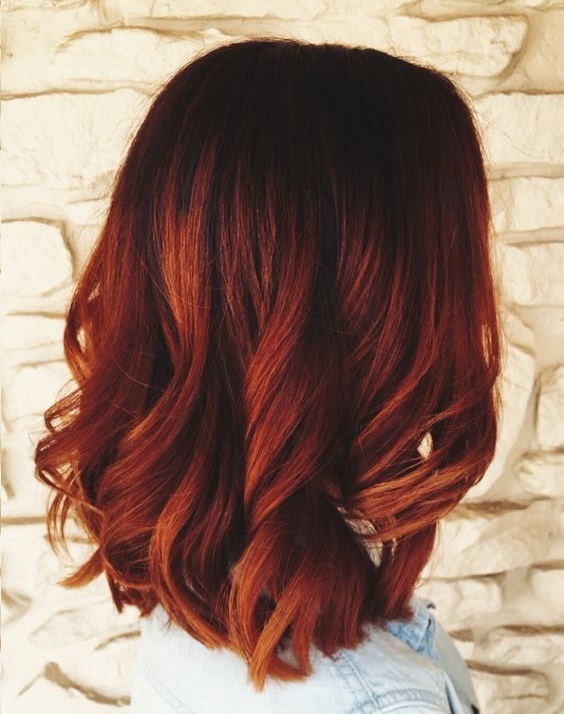 The bottom sports balayage highlights of brown and red that add some fiery touches to the hair. The locks are perfectly layered and styled into nice waves that cascade effortlessly to the bottom. It is a brilliant color solution for the fall season. Sick of your blonde highlights? 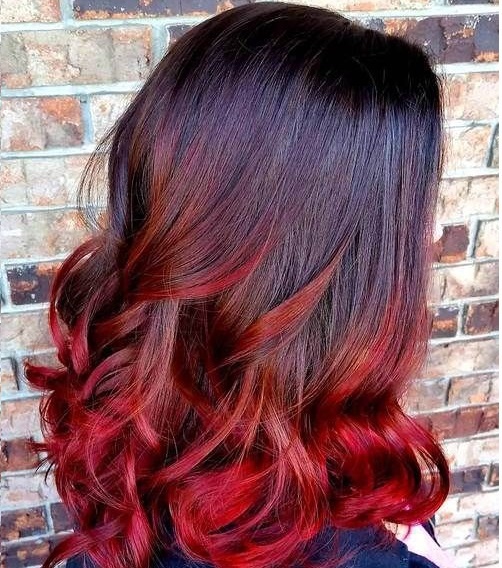 Well, it’s time to upgrade to a red ombre. This is a perfect half-up, half-down ombre. The top part sports natural dark brown hair. The bottom sports dark red tone that adds some life to the sleek locks. 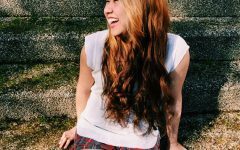 If you don’t desire a sharp contrast in your ombre hairstyle, then this is the way to go. 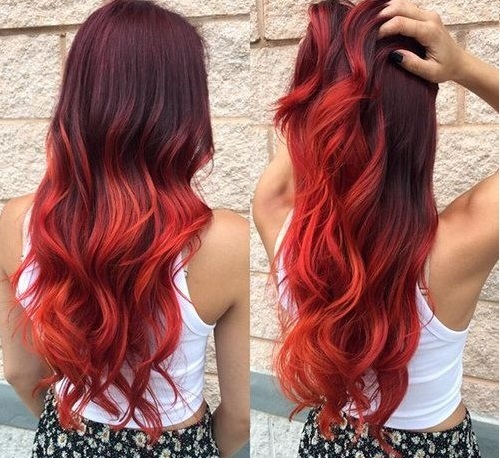 The fiery bottom of this style is simply breathtaking. It has a dark brown top with the fiery tone encroaching to one side. 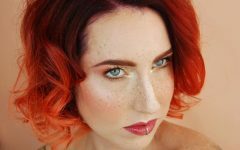 The bottom sports a wonderful combo of red and blonde tones that create fiery balayage highlights. Long beach waves are styled into the locks for that elegant touch. The locks are nicely layered and let to flow down naturally. Dark hair girls might find this style quite irresistible. Dark brown features as the base note. The dark shade is upgraded with balayage highlights of red. The locks are parted and given a wavy look with light spiral curled ends. This is a cool idea for the dark Indian or Asian hair. A little glamour calls for a vibrant color. 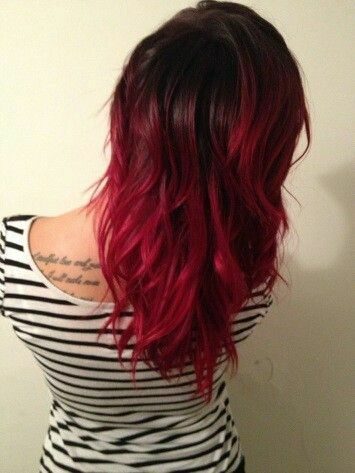 And if you have dark hair, then coloring it bright red at the bottom will help achieve the glamour you desire. The top retains the natural dark brown tone. The locks can be left sleek for that simple elegant look. Additionally, you can pull the front strands to the back and secure them in a nice bun. The ends of the locks are curled to give them a little swing. Want to add some refreshing look to your dark brown hair? Well, leaving the top dark brown and adding balayage highlights of red at the bottom will do wonders. The highlights make the locks more vivid and attractive. The front strands are twisted into a Bohemian braid that is secured to the back with a bobby pin. The hair is textured and sports elegant waves that create that luscious look. This style sports blonde as the natural tone. The blonde covers the top and has red streaks that create a nice balayage ombre. 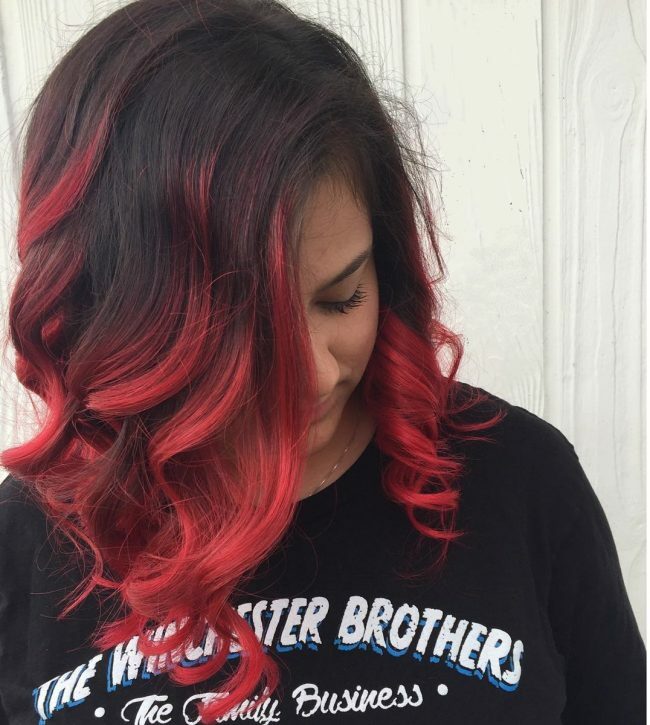 The bottom has pure red tone that is light enough to add a vibrant touch on the hair. The locks are made lighter by styling them into wonderful curls and waves. This is a great style for blondes who are looking for some little fun. 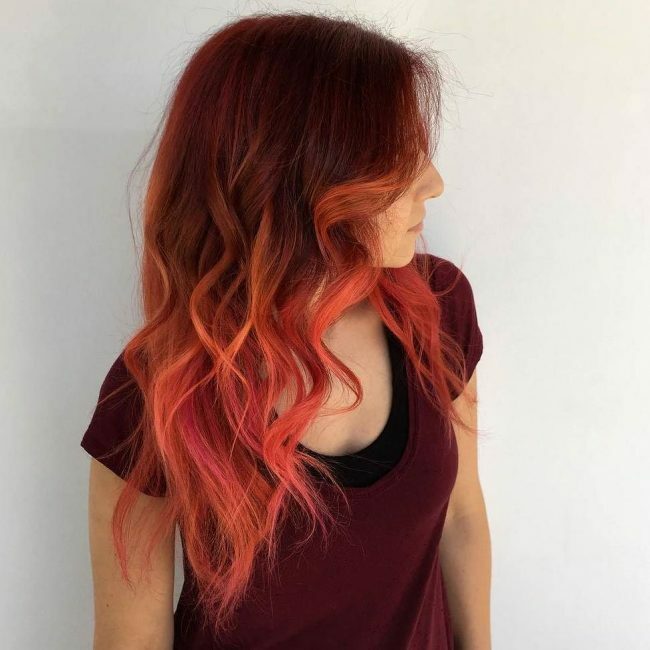 This fabulous look is achieved by dyeing the hair into a wonderful color combo that makes it more vibrant and full of life. 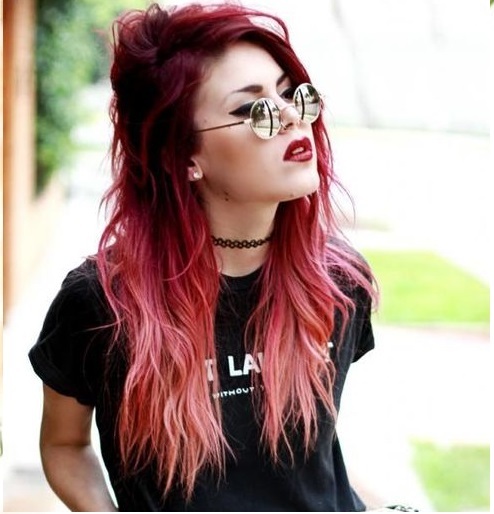 A pastel red adorns the top and stretches almost two thirds the length of the locks. Yellow extensions are used at the bottom to give the hair that “wow” look. The locks sport a sleek look and are given a stylish hime cut that makes them stand out. This style has dark brown at the top. The dark brown shade stretches more on the front. 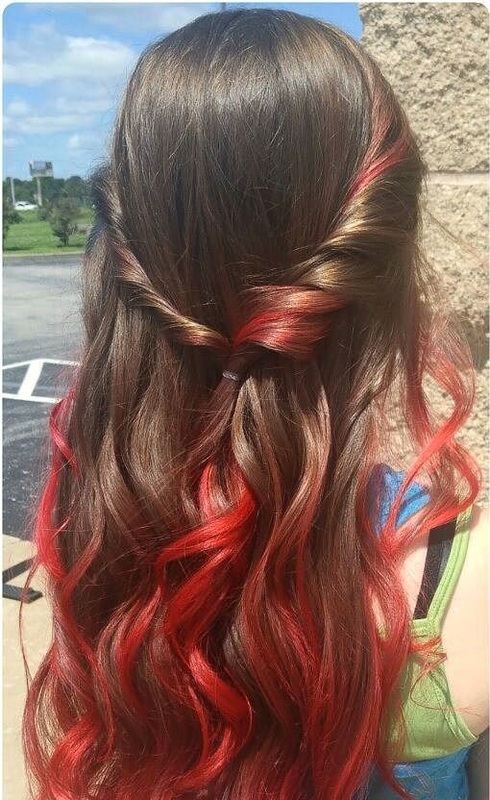 The bottom is colored in light red creating the illusion of sun-kissed hair. The locks have tons of curls at the bottom providing more volume and effortless movement. The result is a flattery style that will make eyes glued on you all day long. Brunettes will find this hairstyle quite easy to experiment with. It sports dark roots that create that shadowy appeal. The dark shade stretches a few inches down and fades into a red tone covering a larger percentage of the hair. The warm tone at the bottom is given an upgrade with sweet spiral waves. This style makes your long bob cut really worth the time and effort. This style takes the elegance of colormelt hair to a whole new level. It sports dark brown shade at the top. 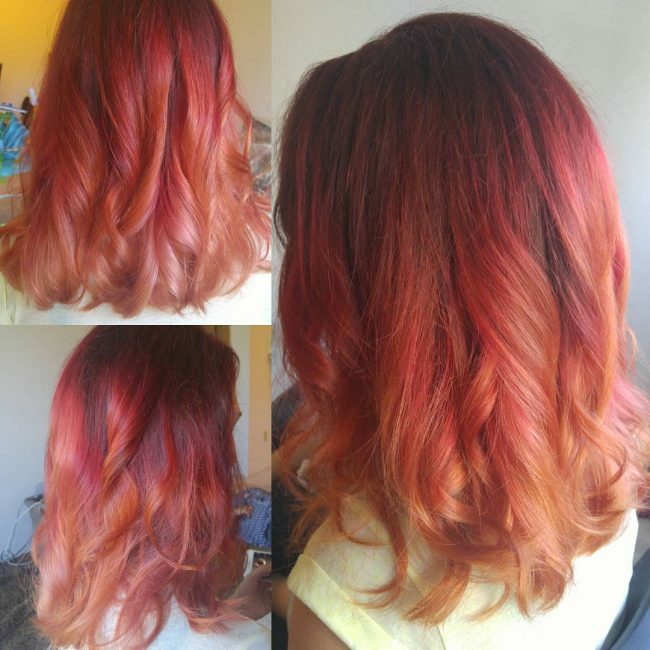 The middle and the bottom section have balayage highlights of red and orange that create a fiery look in the locks. This mermaid hair is styled into lots of elegant waves and curls at the ends. It is perfectly layered to display the tons of volume in it. 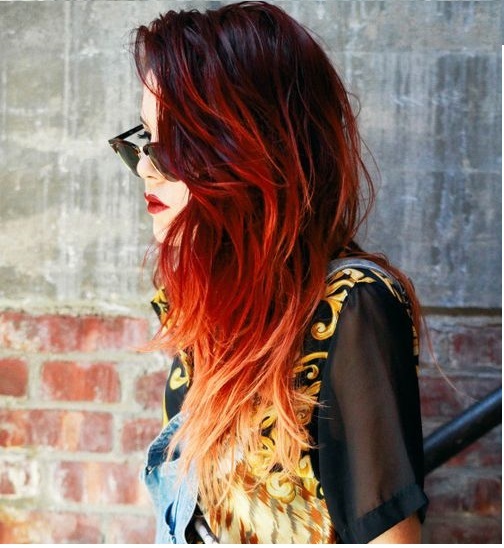 Here is an ombre style that will definitely blow you off. It sports a shiny look with a dark brown tone at the top. The dark brown shade stretches from a few inches from the roots. It slowly transitions into deep red tone that pays close resemblance to maroon. The hair is finished in nice waves that provide a pretty cool look. 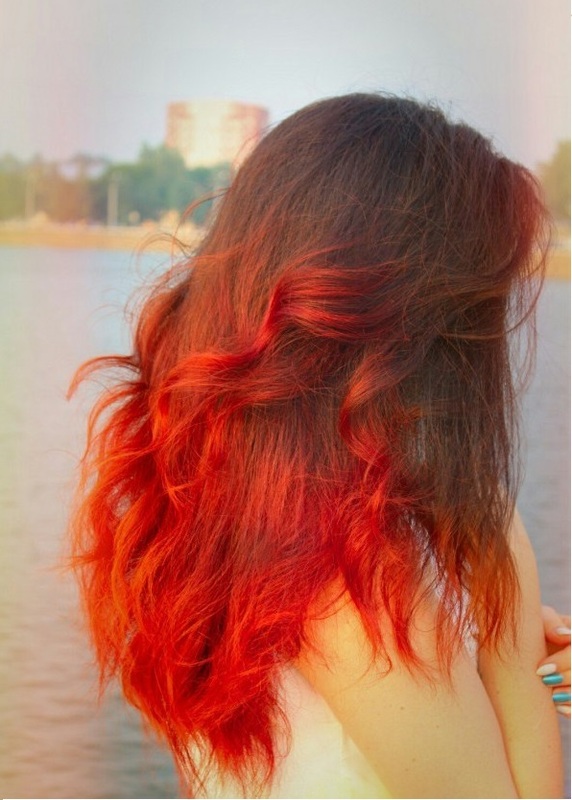 This ombre idea looks fabulous. It provides the elegance of a dark shade at the top and curly extensions at the bottom. 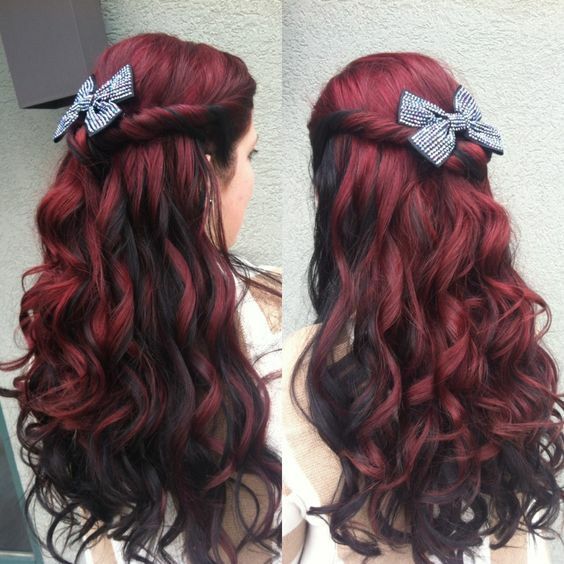 The extensions sport a velvet red tone that makes the hair radiate with great beauty. The hair is worn long extending just above the waist. 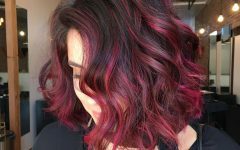 If you want to enjoy the fun of vibrant colors and the world of curls, then this idea is worth a try. 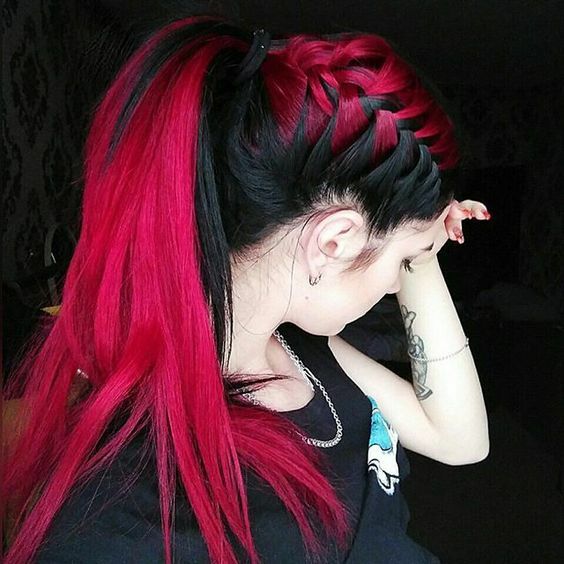 Here, you get to achieve the elegance of a French braid that comes in alternating colors of black and bright red. the hair is pulled back into a high ponytail that is secured with a hair band. This style creates great contrast that makes it much easier to sport. Therefore if you want some attention drawn your way, this is the perfect way to achieving it. This mermaid hair sports a wonderful combination of warm tones. It has a dark brown tone at the top. 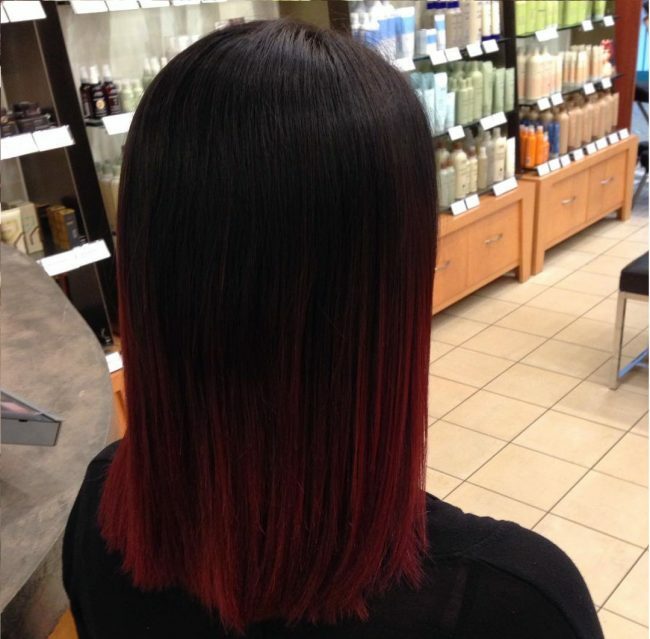 The bottom features balayage highlights of red and bright red tones. The hair is given the elegance of concave waves that accentuate the warm tones. It is a flattery and romantic style that will print the “wow” look in the face of your admirers. This dark brown hair has the top layers colored red. The red highlights create a vibrant canvas over the dark shade of brown. The strands at the front are twisted and pulled back into a halo braid adorned in a bow tie. The hair sports lots of spiral waves and curls that take your gorgeous look a notch higher. This style is more of a balayage ombre. It sports shiny black hair that stretches right from the roots. Peek-a-boo highlights of ruby adorn the bottom and make the curly hair to really stand out. The highlights form a nice balayage that will definitely brighten up your day. This is a nice ombre that has the elegance of a high ponytail. It has a dark red top with a blonde bottom. The style looks quite effortless but has much to offer in upgrading your beauty. It looks really good when paired with a casual outfit. Here is an elegant take on women with medium and short hair. The natural brown locks at the top sport little streaks of red. The red tone grows in intensity towards the bottom. The locks are styled into a concave bob cut that has the flattery appeal of side bangs. 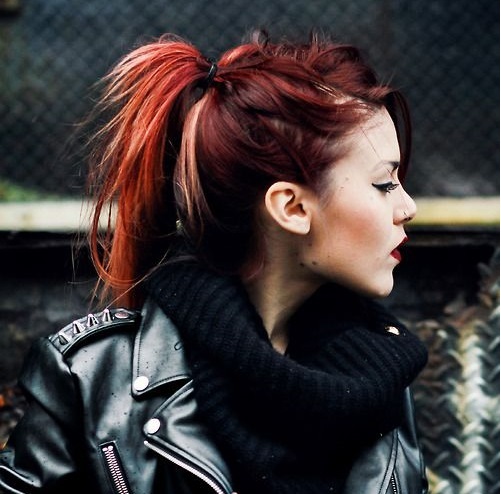 It is a pretty cool hairstyle for casual wear. 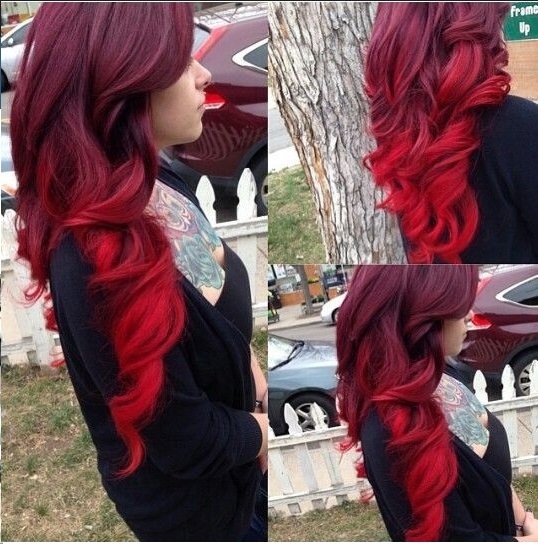 These are just but a few examples of the greatest ideas in red ombre hair. 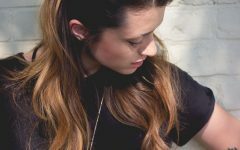 But before trying them out, it would be better to seek your stylist’s advice to determine the color that will match your hair type as well as skin color.